The following photos were taken between May 8 and July 19, 2016, during the Saga’s tendering season, and chronicle just some of the changes that the boat has undergone. Out of the nearly 1,200 photos taken during that period, these are just a few, as there’s simply not enough time to give a tour of every single change, repair, and update being made. When the Saga first came to Captain Jake, she had two fuel tanks full of bilge water and the crew spent the better part of the year since cleaning and siphoning out any good fuel, then had the water tanks and hydraulic tanks completely purged. 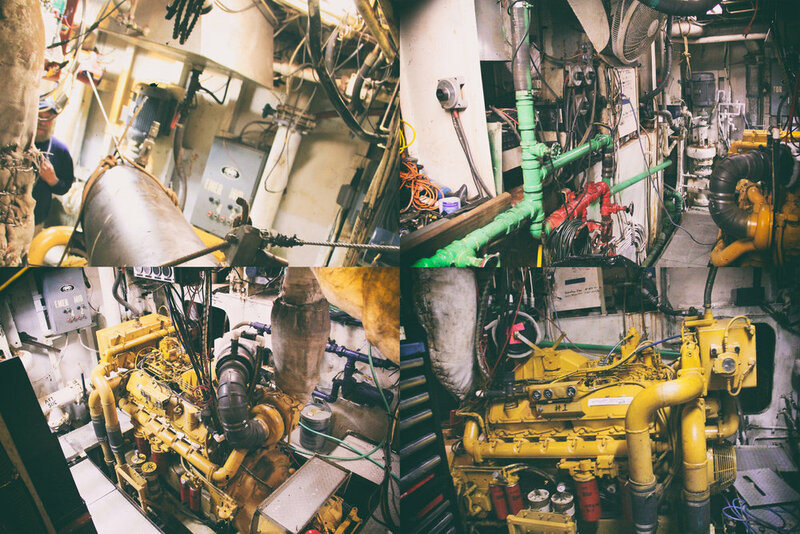 Along with the hydraulics, the rest of the engine room has undergone major renovation, with brand new blower fans, massive amounts of new plumbing, new fuel pump, and a complete rewiring along with the installation of several new breakers. All four engines have also been rebuilt with two new Vulcan couplings installed in gearboxes. Not only that, but the Saga also was given a brand new refrigeration system for refrigerated seawater, new domestic and forward bait freezers, and three new crab pumps. Finally, the engine room has been fitted with all-new LED lighting and fresh paint on all the bulkheads and overheads, deck plates, bilge, and engines. The wheelhouse has also undergone major changes. Originally, the Saga came to Captain Jake without a barometer or a steering wheel, so he made sure those were added to the wheelhouse. Also, new throttles were added, along with all new electronics, from multiple radar monitors and a computer to VHF radios. The entire wheelhouse was also rewired to remedy the previous issues of disheveled and precarious wiring. All in all, everything down from the top of both masts to the engine room was rerouted and rewired to ensure safety and functionality. In this process, the Saga was given new speakers and loudhailer system and readjusted stadium lighting to illuminate the water, along with six new wide LEDs and six new high-pressure sodiums. Also, as an added bonus, the wheelhouse has been outfitted with brand new helm chairs. Special thanks to STIDD for the amazing chairs! They make all the difference in the hours spent in the wheelhouse! In addition to the updates to the wheelhouse, a number of functional and aesthetic renovations were made to the staterooms, heads, galley, and the rest of the deckhouse. As for the deck, the Saga has been outfitted with new pads and cradle for the crane, holding the tire and keeping the pot manageable in the air and high seas. Also added were new counterbalances for the crane swing, fifteen new hydraulic valve handles and a handful of shuttle valves for the crane. The gearbox was rebuilt along with the anchor wench and eight rams, also rebuilt, and a brand new coiler. The pick winch and table have all new valve handles, so now the crew is able to actually land pots from the deck! There’s also a new Yaquina block and secondary Marco block with sheaves on deck, with deck heaters, four peak heaters, and a new stereo system. Finally, it helped to have a certified welder in the crew! The chain lockers had become real monsters, refusing to function well as the chains were stuck in there and the crew had use the crane to yank them out, posing danger. And through electrolysis they had eaten holes out of the side of the boat. These chain lockers and holes are being cut out entirely, with rails put on them like most boats. There is also plenty of metal work being done on handrails and other parts of the boat, to fix everything that is cracked, broken, or in need of replacement.